Almost all of America's private colleges and universities started out as denominational schools, but connections with sponsoring churches gradually attenuated over the last century. Only fundamentalist Protestant denominations and the Roman Catholic Church still maintain colleges and universities closely tied to the spirit of their denominations. Catholic higher education is the largest of these systems, producing a significant proportion of America's college graduates, trained professionals, and doctorates. Andrew M. Greeley argues that Catholic schools are no better and no worse than the vast majority of American higher educational institutions.He chooses a sample of schools varying in the degree to which changes are evident, without revealing this key to his investigator team. Greeley and his field team then visit the schools, interviewing significant segments of each, and characterize each in terms of recent growth and elements which are critical in fostering and supporting such changes. Greeley briefly summarizes information on the history of Catholic higher education. He then furnishes descriptions of three rapid-improvement, three medium-improvement, and three low-improvement schools. In a summary, he provides evidence that the quality of administrative leadership predicts academic improvement in a Catholic college or university. 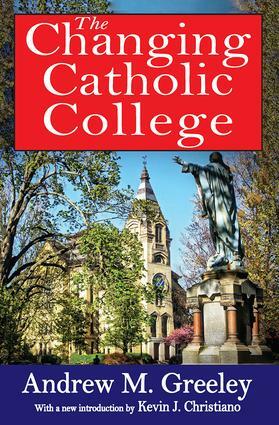 In the final sections, Greeley reviews the administrations, faculties, and student bodies at Catholic colleges and universities, and offers general observations about the outlook for Catholic higher education in the United States.